For a moment I invite you to look at this Passion that we just heard from John and this day that we now celebrate, Good Friday, from a different perspective. Over the centuries as a Church we have often only looked from one direction and that’s where we have just come from, the Lenten Season. It was a time of sacrifice, a time of giving up, but when we do we gather today in sadness despite the fact that on the first day of the Lenten season we’re told not to do that, not to be gloomy. That’s not the point of Good Friday despite the fact that we often do it not just with this day but with our lives, and in particular, we become fixated on our hurts and live a life of victimhood. What I invite you into, though, is to look at it as John did some 70 years after the death of Jesus and from the lens of resurrection, from the lens of Easter. I have said for the past few weeks as we looked at the stories coming from John that he’s a very different interpretation than what we just heard back on Palm Sunday and Matthew’s Gospel. In John’s, from beginning to end, Jesus is conscious of what he does and is aware of not only the choices he makes but also how others respond to him and react to what he does and doesn’t do. Today’s Passion is no different and so it’s not just Jesus but John who’s writing to his community that views from that same lens. In the other gospels, it’s Jesus who is interrogated by everyone as the chaos ensues around him. But not in John’s. It begins that way, but being aware and being conscious of it all, Jesus turns the tables as he does throughout the gospel. It goes from him being on trial to him putting everyone else on trial and interrogating them, without getting trapped into their own chaos and confusion and struggle for power. With that understanding, even to his own death, there is a point to everything that John conveys through images and events in the passion. One of the images that we tend to just flash by is the one, nearing his death, where Jesus has this encounter with the beloved disciple and Mary. He says behold your son and behold your mother. For John, the message he conveys to his community in that moment that a new family, a new community forms out of this moment. They are no longer simply bound by blood or by tribe but by something more. It’s not to say that blood or tribe just suddenly goes away, but as his community forms and this new family takes shape, it’s now the eternal Christ that unites them as a people. For John, what dies on the cross are the bonds that often separate us recognizing from the beginning, as his gospel begins, that it is the Word, the eternal Christ, that lives forever. It’s why it’s a solemn day but not a sad day. From the ancient Church it’s been this passion that we have heard as a people, not to embrace a victim mentality or viewing life through the lens of what was, but rather the new life and the new community that forms. It’s followed up, as the death of Jesus takes place, when a soldier then thrusts a lance in the side of Jesus and blood and water flow out. For John, it all comes together in this moment, life and death, and the birth of a new people, a new family, a new community, flows when blood and water break forth. In the beginning was the Word John tells us and now in this moment, it’s not a lance that thrusts forth but rather new life. It’s the perspective that John tries to convey to his community. This celebration was about coming together to retreat and to reflect upon where we have come from and where the Christ now tries to lead us. I can stand here and ask everyone of you in this church about the suffering of the world and our lives and I would bet that all of us would be able to identify the great sufferings that occur, from the smallest of children blown up by bombs to people killed on the streets, those suffering with great illnesses and so forth, but even that is about the perspective we have on life. It’s so easy to live the life of victim and that is one of the theories that has been drilled into us about Jesus and why this day happens. We could live in what was, embrace our hurts and how we have been wronged or somehow cheated out of something, but, quite honestly, then we might as well live our lives stuck on Palm Sunday and the lenten season and never move beyond. That’s not the grace of this day for John and nor should it be for us. That season of our lives has now ended and a new one is being given to us, a new beginning, as blood and water burst forth from the side of Jesus. As we continue this journey and these days of retreat, we are once again invited to look at it from a new perspective, one that offers life rather than more resentment, loss, and victimhood. It serves us no good anyway. What are the symbols and images that seem to be touching our hearts at this very moment, where the Word now tries to break forth in our lives. We live our lives in hope and are called, as Jesus is in John’s Gospel, aware and conscious of who we are and what we do in the face of such suffering, often brought on by our own unawareness, and to be freed to embrace the new life. In the end, for John, it all comes down to this as Jesus breathes the spirit upon this new community as he takes his last breath. Yes, something dies but what remains is the eternal and it is the eternal Christ that stands as our truest bond as community and as family. It’s a rather unusual day. Yes it is Good Friday but maybe somewhat providential, if you follow the Church calendar March 25th is actually the day that we normally celebrate the Feast of the Annunciation. It rarely happens that the two coincide and won’t happen again for decades, but here we are today. Of course, that feast gets pushed back until after Easter but there are striking similarities as we mark Good Friday. It’s the day that the beginning and the end, the first and the last, the alpha and the omega, converge into this one event. But there is more. The one that remains consistent through the story is Mary. The angel Gabriel appears and announces the news of the Christ, tells her not to fear, behold the handmaid of the Lord, may it be done to me according to your word. All of that, along with the basic human reactions with fear, that of doubt and questioning what this message is all about. Then there’s today, Good Friday, and we meet Mary at the foot of the cross. What the heck was that message from Gabriel all about? Is this really what God had planned for His Son? Probably much of what Mary had experienced at the beginning she now encounters at the end, questioning God’s plan and wondering what all of this can mean. It’s easy to say that she knew. She was with him through it all and the disciples were there to follow and heard the stories and the predictions. But, in our deepest grief and loss, none of that seems to matter. All we know is pain and rejection in that moment. But then there’s also Jesus. How the heck did he get to this point? He too questions from the Garden to the Cross what all of this means and whether it’s necessary in this way. We all know that he didn’t do anything wrong. Even Pilate claims him not to be a criminal. Yet, there he hangs, before his mother, watching in disbelief of the horrific way he is to die. But he seems to have backed everyone into a corner. No one wants to take responsibility. No one wants blood on their hands because they know there’d be an all out revolt among the people. John tells us that Jesus simply is here to testify to the truth. And yet, for those in authority in these institutions, Pilate and the political authority and the Chief Priests and Pharisees want to bear no responsibility for what is to unfold. He becomes a victim of their own game and they manage to turn the people against him. Death is looming. Grief is stricken. The end is beginning for this man, Jesus. There are many theories as to why this all happens in this way. We’ve heard them all and have come to believe many of them. Sure, there is dying for our sins and setting us free from sin and death. That is all true and part of the truth. But like Pilate and the Pharisees, we also like to end it there, bearing no responsibility for following him all the way, only to find ourselves falling short when we get to the cross. For Mary and the disciples, the message that has been consistent all along has been to follow him. That’s it! And yet, when we become overwhelmed by the darkness of our lives, our inclination is to be like the disciples at this point. We fall back to what we know and we seek to please, going along with the crowd yelling, crucify him! All seems lost. Darkness hangs in the balance now. Mary, may it be done to me, now stands by idly, watching her son die. It can’t be easy. His pain is her pain and her pain is his. Every parent knows what that is like as you watch your sons and daughters suffer in different ways. Is it any wonder we turn away and try, and that’s all we can do, is try to return to a normal life. But normal life is no longer. It is the beginning and the end. Despite the pain and hardship, Mary and Jesus remain faithful to that command of turning it over to the Father. May it be done to me. And maybe that’s the point. None of us would ever choose to do it ourselves, but rather, only by the grace of God I shall go, not coming up short, but all the way to the cross. It’s so hard to see beyond that threshold that it creates for us. We become victims of our own hurt and suffering that when we’re in that moment, we lose sight of the light and the life that is promised us. Then more than ever is faith necessary and to reconnect to our larger story, the story of the Passover, the story of the great Paschal Mystery. As generations pass it’s easy to disconnect from the lived reality, yet, it is the only way to persevere as we stand at the foot of the cross with Mary, reminded, in faith, of the life to come. There is something different about this day. It is the beginning and the end, as well as the beginning of the end as we face yet another threshold before us. We imagine ourselves at the foot of the cross with Mary, silently uttering her prayer and the prayer of Jesus, may it be done to me according to your will, not my will but your will be done. In a world plagued by injustice and abuse of power, it truly is only the truth that will set us free, even in the face of such suffering. God suffers with us this day and weaps with us as we continue to try to back God into a corner to do something, anything, so that like Pilate and the Chief Priests, we can stand idly by watching the suffering of our world, not wanting blood on our hands. Yet, we already do when love and mercy escapes us. It is the challenge of Good Friday and an even greater challenge when the beginning and the end converge on this day. All we can do is stand with Mary and pray with Mary that God’s will be done and that my life too may testify to this truth, that, in the end, love and mercy will always endure. You need only turn on the news for a few minutes and see how easy it is to become what we hate. There’s so much violence, judgment, hatred, which signifies just how much hurt and suffering exists. We become what we hate when we don’t have the ability to self-reflect,a prophetic eye, to see what it is that needs to die within ourselves. All this, so often as we have seen, in the name of God, in the name of religion, which has gone on since the beginning of time. How easy it is to become what it is we hate. How quickly, also, the crowd turns on Jesus. Remember back to the entrance on Palm Sunday as they waved palms, welcoming him into the eternal city. Hosanna in the Highest! And yet today, crucify him! When the tension begins to build between Jesus and those John refers to as “the Jews”, which isn’t what we mean it today, but rather the leaders of the faith, the Pharisees and others, the crowd quickly begins to change its tune. They quickly give into the fear projected on them by the leaders who are threatened by Jesus’ true power, as he refers in today’s Passion reading, a power from above. Fear becomes the call of the people in the face of such love, passion, and suffering; Jesus stands in the midst of it watching it crumble, a world created by man while he opens the door to THE Kingdom, built on love. Yet, we become what we hate. We are uncomfortable with Good Friday and everything that is good about it. We’re uncomfortable with the emptiness of the church, showing the depths of our own being and where God invites. We’re uncomfortable to come and reverence in some way the wood of the cross that will lie before us. Something deep within us tries to hold us back from approaching the emptiness, the wood of the cross, despite the knowing of a deeper reality that this is the true us imprinted on our very souls. Rather than becoming what we hate, the Cross invites us to become the love that God created us to be. You see, this cross isn’t just some external reality that we come and venerate. No, it’s our story, unfolding every day of our lives, leading us deeper into the recesses of our being, the emptiness that leads us to a radical poverty, a radical love, that can only be manifested by a God that loves beyond all understanding. This is the day, not to mourn, but, yes, to remember the death of Christ, but the reality that it’s our story as well. We don’t have to settle for becoming what it is that we hate. There’s enough hatred and violence in the name of God in our world; but our God leads us to the truth of who we are as people, through the cross, into the depths of our being, our soul, imprinted by Christ, to become who Christ was and is to us, God’s great and everlasting love and to share that gift with the world. It comes through a radical poverty and emptiness of our lives, through the cross. It comes through a radical love, only possible through the cross. It comes from a great trust that Christ invites us into this day, naked, vulnerable, exposed, and yet, a love that transforms our lives and our world not into what and who we hate but into a manifestation of that love. O Come, Let us Adore. There is nothing more humbling as a presider than on this night in what we will do in just a few minutes when I’m sitting on this chair watching everyone come forward to venerate the cross in some way, whatever way we choose. It means even more as you get to know people’s stories, listen to their confessions, walk with them in their struggles, and be with them when the cross is staring at us straight in the eyes. It’s a humbling experience because the cross is very real. Yet, it’s also somewhat awkward and somewhat uncomfortable for us as we approach and venerate. We become accustomed as humanity to think that somehow my suffering is only mine and that no one else would understand and somehow I stand alone and don’t want everyone to know how I suffer. It’s mine. Yet, if one of us suffers, we all suffer. The human condition tries to tell us that, but coming up here and venerating it in our own way reminds us that it’s real, pain and suffering are real in all of our lives, and this one cross that we walk to and journey to this evening unites us all in the One True Cross of Christ. We run the risk as we do at Christmas to make this into a strictly historical event, that because Christ suffered death, even death on a cross, that I no longer have to. 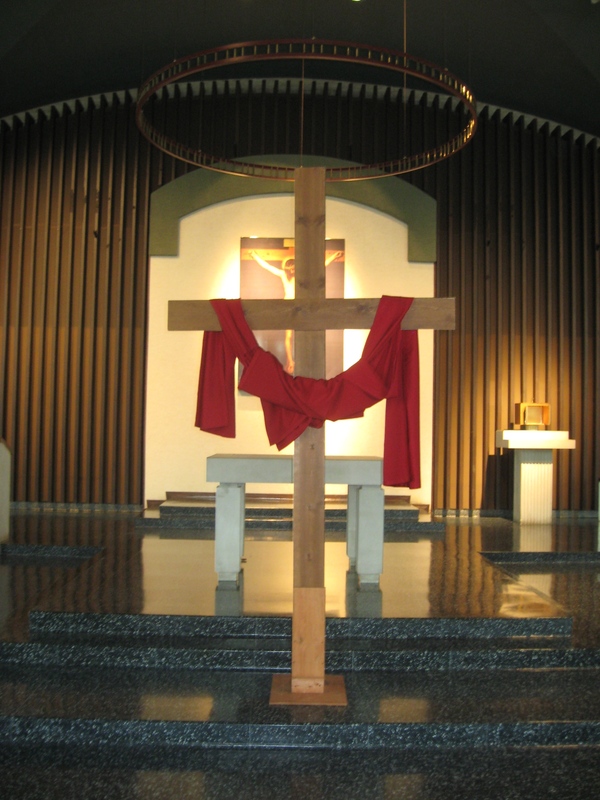 Yes, it did happen but from the moment we are presented at this baptismal font on the day of our baptism, that cross is emblazoned on our hearts and souls and we enter into a mystery that is beyond words and so often beyond understanding. We know it from our own suffering and when we face that cross, it narrows our vision, the pain is real, at times have difficulty seeing hope and life, we become consumed by the Cross trying to lead us to being consumed by Christ. Christ’s death gives dignity to our death and allows it meaning. The Cross gives us something to push against…and we push and we push and we push, and we pray and we pray and we pray, and we hope and we hope and we hope, and one day God pushes us through that cross, for it is only in death and in this Cross that life breaks forth. As much as we may not like it, it is the reality. It is the mystery we celebrate tonight. We know we can spend weeks and months and years pushing and praying and hoping and pushing more, trying as Jesus tells us, to be pushed through the cross, pushed through the narrow gate, pushed through the eye of the needle. It’s hard. It hurts, It’s painful. But when we finally surrender to the mystery of life and death and allow God to push us through the Cross, life happens. We may not see it right now in our lives, but life happens. As we approach this cross this evening and to venerate it in whatever way God has called you, allow yourself to name that cross. What does it look like in your life? How has Christ suffered with you? How have we suffered with you or maybe even alone? We can push and push and push, and we can pray and pray and pray, and we can hope and hope and hope, and when we can name it and accept that it is us, a crack opens and God pushes us through to new life, not only in eternal life but in the fullness of life he desires for us today.